Sukabumi is a rare colour, with the unique green colorings ranging from Jade to Emerald . When this stone is wet it brings out the vibrant green tones, Sukabumi originally from Indonesia is frequently used in the swimming pools of 5 star luxury Balinese hotels. This stone is little water absorbency and is thermally stable, meaning it doesn’t absorb heat of those hot Queensland summer days. Green Sukabumi contains zeolite which purifies your water but absorbing contaminants and bad odors. 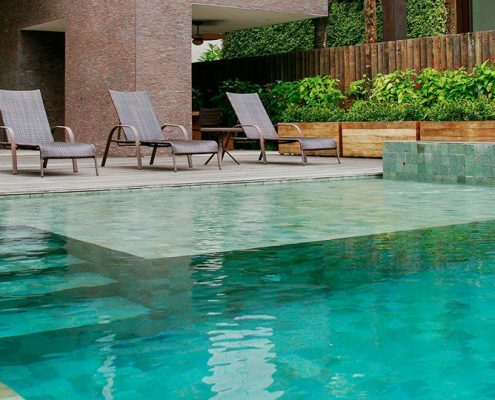 Green Sukabumi is a exceptionally stunning stone that would look amazing in a Queensland pool surrounded by lush greenery.